Summer was made for these Peach Caprese Stacks. 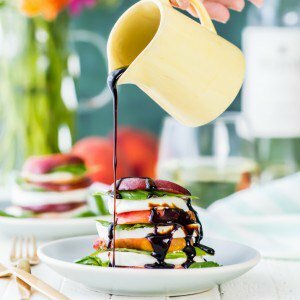 I'm holding onto Summer as long as possible with these healthy Peach Caprese Stacks with Honey Bourbon Balsamic Reduction! Salad just got a makeover! In a small sauce pan, bring the balsamic, sugar, and bourbon to a boil (plus honey if not using the honey bourbon). Reduce to a simmer and allow to simmer until reduced by half. It will become a syrupy consistency. Simmer for at least 15 minutes. While balsamic is reducing, heat olive oil in a large skillet. Add peaches and cook on each side until extra tender and juicy; about 5 minutes. Set aside. To assemble your stacks, start with a peach slice, then mozzarella, the basil. Repeat three times. Top with the Honey Bourbon Balsamic Reduction.